July 12 has been designated Malalah Day in honour Of Pakistani activist Yousafzai (Malālah Yūsafzay, Who was born 12 July 1997. She is the youngest-ever Nobel Prize laureate and is known mainly for human rights advocacy for education and for women in her native Swat Valley in the Khyber Pakhtunkhwa province of northwest Pakistan, where the local Taliban had at times banned girls from attending school. Yousafzai’s advocacy has since grown into an international movement. Her family runs a chain of schools in the region. In early 2009, when she was 11–12, Yousafzai wrote a blog under a pseudonym for the BBC detailing her life under Taliban occupation, their attempts to take control of the valley, and her views on promoting education for girls in the Swat Valley. The following summer, journalist Adam B. Ellick made a New York Times documentary about her life as the Pakistani military intervened in the region. Yousafzai rose in prominence, giving interviews in print and on television, and she was nominated for the International Children’s Peace Prize by South African activist Desmond Tutu. On the afternoon of 9 October 2012, Yousafzai boarded her school bus in the northwest Pakistani district of Swat. A gunman asked for her by name, then pointed a pistol at her and fired three shots. One bullet hit the left side of Yousafzai’s forehead, travelled under her skin through the length of her face, and then went into her shoulder. In the days immediately following the attack, she remained unconscious and in critical condition, but later her condition improved enough for her to be sent to the Queen Elizabeth Hospital in Birmingham, England, for intensive rehabilitation. On 12 October, a group of 50 Islamic clerics in Pakistan issued a fatwā against those who tried to kill her, but the Taliban reiterated their intent to kill Yousafzai and her father, Ziauddin Yousafzai. Best known as the Drummer for the rock band Kiss from 1980 to 1991, the American Musician Eric Carr (born Paul Charles Caravello was Born July 12. Caravello was selected as the new Kiss drummer after Peter Criss left, when he chose the stage name “Eric Carr” and took up the “Fox” persona. He remained a band member until his death. While still in high school, Caravello began playing with a string of bands mostly performing covers of Top 40 songs. As he described it later, “Top-40 in those days was everything – funk, ballads, rock, country, and everything. It was a great time for radio.” His first band, The Cellarmen, was formed in 1965 by him and several of his friends. They started playing local clubs in Brooklyn and Queens. Only a handful of recordings were released on the Jody Records label, a small Brooklyn recording studio. Caravello then joined a band called “Things That Go Bump In The Night” and later “Smack”, the latter of which consisted mostly of members from The Cellarmen, who disbanded in 1968. In 1970, Caravello joined the band Salt & Pepper, In 1973 the band changed their name to Creation, now performing disco music. Tragedy struck in 1974 when a fire broke out during a discothèque gig at Gulliver’s restaurant in Port Chester, New York, killing dozens of people including the band’s keyboardist and lead singer. Caravello escaped and was credited with saving one of the band’s female singers. The band continued on, sometimes under the name, “Bionic Boogie”.And Carr played with the band until they broke up in 1979. Then In December 1979, Caravello successfully auditioned for a four-piece rock ‘n’ roll cover band called Flasher. To Earn money, Carr worked repairing gas ranges during the day and also worked for his father as an oven repair man for Jamaica Stove in Brooklyn. Flasher played the club circuit in New York City and Long Island for several months, before their keyboard player, Paul Turino quit; they then continued as a power trio, with the three sharing vocal duties. They played songs by Joe Jackson, Van Halen, Led Zeppelin and Jimi Hendrix, among others.” Caravello quit in May 1980. And considered quitting music However Shortly afterwards, he had a chance meeting with Turino in a club in Queens; Turino told Caravello about Peter Criss’ departure from Kiss, and urged Caravello to audition to become Kiss’ drummer. So Caravello auditioned for Kiss, and actually asked Stanley, Simmons and Frehley to autograph the list of Kiss songs he was to play with the band, in case he never saw them again. 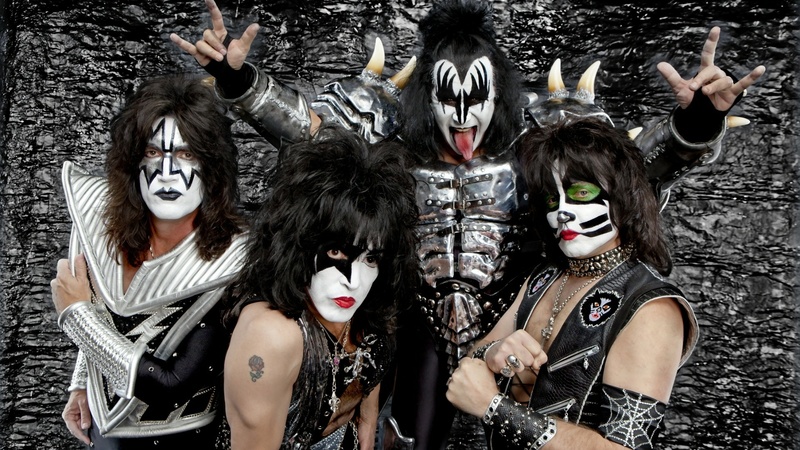 However he was invited to join Kiss after passing the audition, however the band had some trouble coming up with a character persona and a stage name for him before his debut concert. Carr’s first album with Kiss was 1981’s Music from “The Elder”, which marked a departure for the band toward a mystical art-rock direction. One of Carr’s contributions to the album, “Under the Rose”, is one of the few Kiss songs written in 6/8 time and featured a Gregorian chant-style chorus. Later, he would also have cowriter credits on “All Hell’s Breakin’ Loose”, “Under the Gun”, and “No, No, No”, amongst others. Carr said he found writing lyrics harder than writing music. Besides drumming, Carr also played guitar, bass guitar, and piano and sang background vocals. Occasionally he sang lead vocals, such as on “Black Diamond” and “Young and Wasted” live with Kiss. His first lead vocal in the studio was a re-recording of “Beth” (a song originally sung by Peter Criss) for the 1988 compilation album Smashes, Thrashes & Hits. Carr recorded his version of the song in the same room in the Record Plant where the song was originally recorded, using the same backing track as Criss. In 1989, he recorded a demo with Kiss lead guitarist Bruce Kulick. Carr wrote the music, played bass and drums, while Kulick played guitar. As Carr was not a proficient lyricist, he presented the demo to Simmons with the words to Marvin Gaye’s 1965 classic “Ain’t That Peculiar”. Simmons wrote new lyrics, which Carr recorded for the subsequent Hot in the Shade release. The song was released as “Little Caesar”. He performed the song a few times, but it wasn’t performed beyond the first month of the tour. Carr’s last live performance with Kiss was November 9, 1990 in New York City, at Madison Square Garden. Carr’s last recording with Kiss was for the song “God Gave Rock ‘N’ Roll to You II”, which featured him on backing vocals. The last time Carr worked with Kiss was in July 1991 when Kiss filmed the video for “God Gave Rock ‘N Roll to You” with Carr playing drums. Carr’s last public appearance with the band was at the MTV Video Music Awards in September 1991 and he tragically died of complications from heart cancer on November 24, 1991, at the age of 41. Tommy Ramone, (Thomas Erdelyi) last surviving member of punk band the Ramones, died age 62 On 11 July 2014. 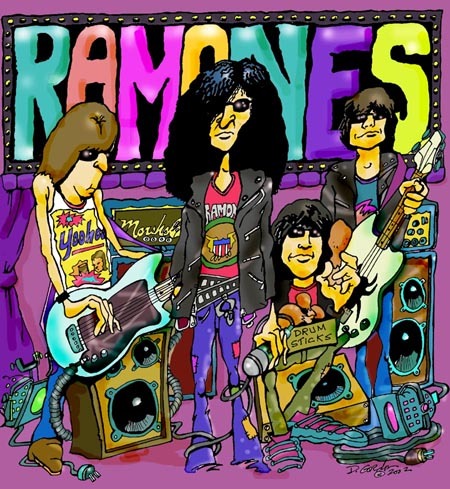 The Ramones were founded by Guitarist and songwriter Johnny Ramone, (John Cummings) in the New York City neighborhood of Forest Hills, Queens, in 1974, All of the band members adopted pseudonyms ending with the surname “Ramone”, though none of them were related. The original members of the band met in and around the middle-class neighborhood of Forest Hills in the New York City borough of Queens. John Cummings and Thomas Erdelyi had both been in a high-school garage band from 1966 to 1967 known as the Tangerine Puppets. They became friends with Douglas Colvin, who had recently moved to the area from Germany, and Jeffrey Hyman, who was the initial lead singer of the glam rock band Sniper, founded in 1972. However Soon after the band was formed, Dee Dee realized that he could not sing and play his bass guitar simultaneously; so Joey became the band’s new lead singer. Dee Dee would continue, however, to count off each song’s tempo with his signature rapid-fire shout of “1-2-3-4!” Joey could not sing and play drums simultaneously either and left the position of drummer. While auditioning prospective replacements, Erdelyi often demonstrated how to play the songs. It became apparent that he was able to perform the group’s music better than anyone else, and he joined the band as Tommy Ramone. the Ramones played before an audience for the first time on March 30, 1974, at Performance Studios. The songs they played were very fast and very short. Around this time, a new music scene was emerging in New York centered around two clubs in downtown Manhattan—Max’s Kansas City and, more famously, CBGB (usually referred to as CBGB’s). The Ramones then disbanded After having performed 2,263 concerts, touring virtually nonstop for 22 years. Sadly a little more than eight years since the breakup, the band’s three founding members had all passed away—lead singer Joey Ramone, guitarist Johnny Ramone in 2004 and bassist Dee Dee Ramone in 2002.Sadly heir only record with enough U.S. sales to be certified gold was the compilation album Ramones Mania. However, recognition of the band’s importance built over the years, and they are now cited in many assessments of all-time great rock music, such as the Rolling Stone list of the 50 Greatest Artists of All Time and VH1′s 100 Greatest Artists of Hard Rock. In 2002, the Ramones were ranked the second-greatest band of all time by Spin magazine, trailing only The Beatles. On March 18, 2002, the Ramones—including the three founders and drummers Tommy and Marky Ramone—were inducted into the Rock and Roll Hall of Fame. In 2011, the group was awarded a Grammy Lifetime Achievement Award.